A kitchen essential, this Essteele Per Vita 18cm/ 2.8L covered saucepan is a pleasure to cook with thanks to the solid copper that is spread across the induction suitable base, allowing heat to disperse evenly and quickly. This results in optimum heat control and perfect cooking conditions favoured by the most discerning cooks. The elegant and refined design is crafted from high quality polished stainless steel for superior durability and shine. 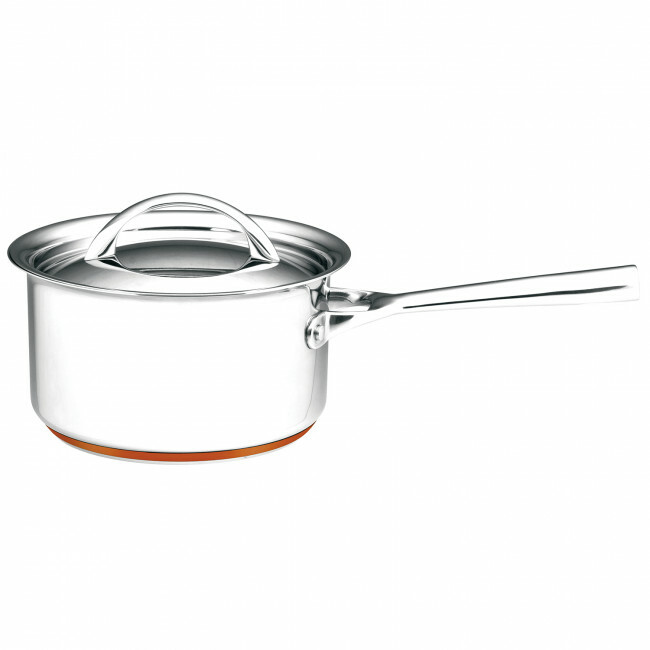 Handles and lids crafted from stainless steel ensures this 18cm/2.8L saucepan will last a lifetime. The saucepan is dishwasher safe, and oven safe to 240°C for added convenience. Essteele Per Vita 18cm/2.8L Saucepan is rated 4.5 out of 5 by 10. Rated 5 out of 5 by gogogasgas from A Lifetime of Quality I've been using Esstelle with great satisfaction since the late 1970s. The Per Vita range surpasses my already high expectations. The high standard finish and overall quality are immediately noticeable. The PerVita's hefty copper bottom bases means that the saucepans hold and spread the heat evenly making cooking efficient and pleasurable. The stainless steel finish makes cooking and cleaning easier and is beautiful to behold. All this and a lifetime guarantee! Excellent! Rated 5 out of 5 by Sarah100 from Beautiful cookwear Very nice looking pot. Cooks evenly. Washes up beautifully in the dishwasher. Rated 5 out of 5 by pgreenba from Best on the market The old saying "you get what you pay for" is true in every sense of the word. While not the most expensive on the market, quality wise Essteele products are right up there, even heat distribution, a dream to clean, and five years later will still look as good as the day they were purchased. As you can gather, not my first Essteele product, and I would not buy anything else. Rated 5 out of 5 by Trace5668 from good quality really happy with this saucepan. It's nice and sturdy, but not too heavy, cooks great, and I'm really happy it has a lifetime guarantee, which totally makes it worth the money. You'll never have to buy another one.